The shape doesn’t work well with small 3″ zips (opening is too small), and a bigger purse would look funny so I wont be sharing that tutorial with you. BUT annoyed at my silly purse I was determined to make a different one using my new lovely zips and I made these! They are super easy, fast and cute. They are big enough to keep bank cards, public traffic cards and a bit of spare change in. And I included a little ribbon loop so they can go on your keys too. To make I used wool mix felt from sew sweet, 3″ zipper from zippit, some ribbon and sequins I had lying around. Cut two 9.5cm by 10.5cm squares from your felt, and a 6cm length of ribbon. I added a scalloped edge to the top of my felt (the 9.5cm side). Depending on what felt you use and how good your scalloped scissors are this may be easy or hard, so I suggest trying on a scrap piece of felt before you ruin the main pieces of felt. If you don’t have scalloped scissors you can try cutting a wave yourself, you just need to not make it too big. I had some sequin butterflies lying around so sewed them on, but you could make a felt flower, or embroider a cute picture onto it or buy some premade felt embellishments, lots of options! Fold your ribbon in half and pin it about 1cm down from the zipper along the edge. Then fold the felt squares right side together and pin around the edge. Sew all the way around the purse. Be careful of the metal gripper at the end of the zipper! Cut the excess zip fabric off at the end the zipper connects. And at the other end fold over the edges at an angle and add a few stitches to keep them down and out of the way of the zipper (I don’t suggest cutting these as it will weaken your seams). Turn your purse right way out and it’s all done! I am sharing this tutorial on lots of different blogs. View the full list of link parties I take page in. This entry was posted in Felt, Tutorials on September 18, 2011 by Handmade Cuddles. 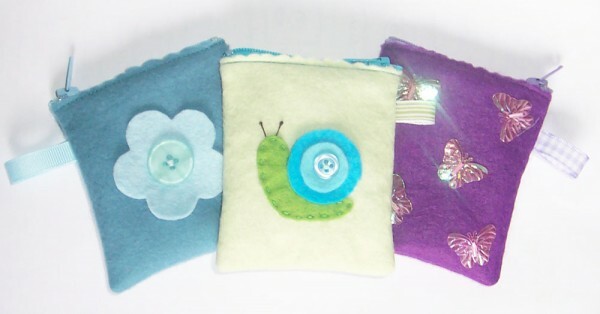 That snail is the cutest applique I have ever seen. Great job on the little pouches. They are really cute! Great tutorial! These are adorable. I found you through Sugar Bee’s Link Up. I want to know if I can put a link of the tutorial in my blog. I like it too much. Congratulations for the work. Kisses. Claudia. What a sweet purse its great for gifts, thank you for sharing your tutorial.